A contemporary adaptation of a 1971 satirical text by one of Urdu's best-known poets and humourists of the 20th century; short stories by Munshi Premchand and Kashmiri writer Amin Kamil on the political turmoil in Kashmir; 19th century poet Mirza Ghalib defending himself in a modern-day court against charges of composing offensive lyrics in a ghazal; or the exchange of letters between an incarcerated Faiz Ahmed Faiz in Pakistan and his British wife Alys between 1951 and 1955. The four-day Urdu Drama Festival at the Ghalib Institute from July 6 might be a great opportunity to sample recent productions from the world of Urdu theatre. Although not unanimously agreed, it is believed that the first drama to be written in Urdu was in 1853 by Amanat for the last king of Awadh, Nawab Wajid Ali Shah. It was modelled on the French opera, a romance between a prince and a fairy. Performed in the royal palace of the Nawab, the king and his courtiers also featured in the cast. Since then, Urdu theatre has traversed a richly scintillating journey, developing through effervescent 'Parsi Musicals' to a more serious post-Parsi dramas concerned with social and moral issues. Later on Prithvi theatre and Indian People's Theatre Association further honed and chiselled socially committed Urdu theatre. The artistically-inclined Begum Abida Ahmed, wife of Fakhruddin Ali Ahmed, president of India from 1974 to 1977, set up the Humsub Drama Group in 1974. This post-Independence drama group has actively sought to revitalise the glorious tradition of the Urdu stage and has put out numerous seminal productions with well-known playwrights and thespians like Habib Tanveer, B.M. Shah and Nadira Babbar. Attached with the Ghalib Institute, Humsub has been curating drama festivals in Abida Ahmed's memory and this year's line-up includes plays by eminent directors like M.K. Raina, Danish Husain, Salima Raza and Danish Iqbal, among others. Headlining the festival is The Hoshruba Repertory's Qissa Urdu Ki Aakhri Kitaab Ka. It is based on Ibne Insha's classic text Urdu Ki Aakhiri Kitaab (Urdu: The Final Book), a unique collection of satirical pieces written in the format of a textbook with chapter divisions on history, geography, mathematics, science and policy education. Ibne Insha (1927-78) is considered to be one of the best humourists in the history of Urdu literature and is also known for his poetry and travelogues. 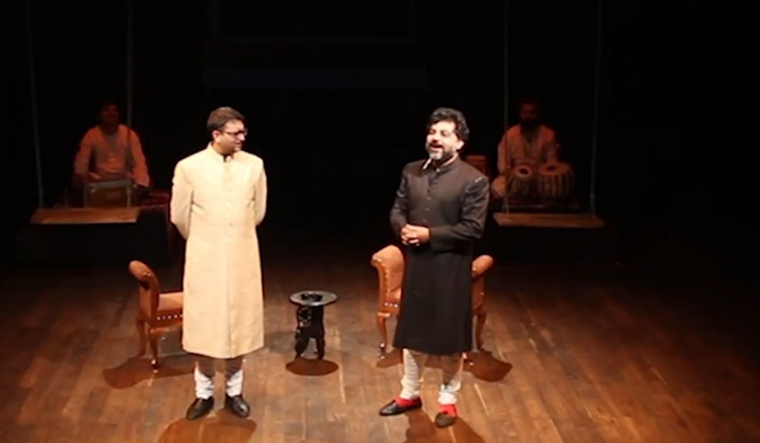 Danish Husain's play situates the text in present-day India with a boisterous mix of stand-up comedy, storytelling, talk-show banter and farce with interludes of classical music and recitals from Ibne Insha's lush poems which are reminiscent of Amir Khusro's distinctive style. Danish Husain is known for plays like Guards At The Taj, Ek Punjab Ye Bhi, Chinese Coffee, Krapp's Last Tape, and the storytelling project Qissebaazi. "This is probably the most important play in the entire festival. Qissa Urdu.. is quite popular with the audience," says Syed Raza Haider, director of Ghalib Institute. Qissa Urdu Ki Aakhri Kitaab Ka was performed at the Prithvi Theatre last year to glowing reviews.